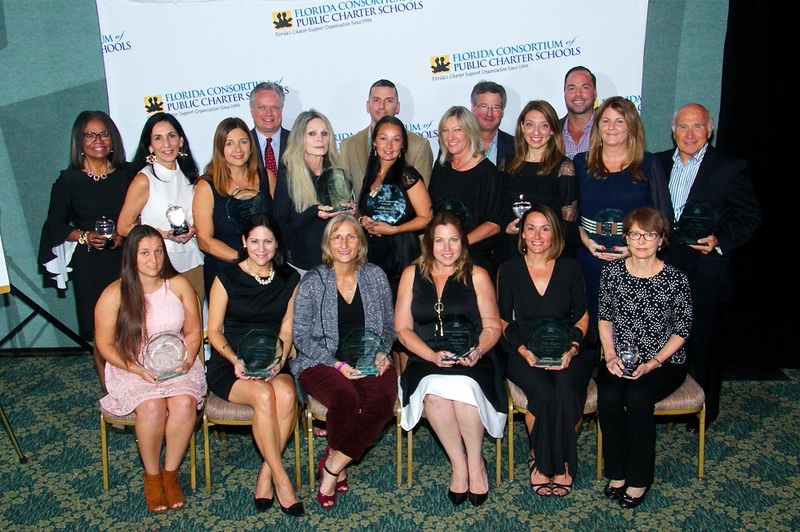 The Florida Consortium of Public Charter Schools (FCPCS) has honored winners of its 2018 Florida Charter School Champions Awards, which were presented at the at the recent Florida Charter School Conference in Orlando on October 17, 2018. Champions Awards for charter school board members were presented to Jim Notter of South Tech Schools in Boynton Beach, Any Banov of Sebastian Charter Junior High School in Sebastian, John D'Amico of St. Cloud Preparatory School in St. Cloud and Ana Diaz of Somerset Academy, with various South Florida locations. Champions Award winners in the category of charter school leaders were Carlos Alvarez of the City of Hialeah Educational Academy in Hialeah, Tammy Lara of SunEd High School in Margate, Kelly Mangel of Treasure Village Montessori in Islamorada, Tracy Nessl of Charter Schools of Excellence in Davie and Pamela Dwyer of Oakland Avenue Charter School in Orlando. Winners of Champions Awards for charter school teachers were Arlene Gebber of Somerset Academy Boca in Boca Raton, Denise James of Hope Charter School in Ocoee, Cynthia Pierre of Charter Schools of Excellence in Davie, Tiffany Hunt of Burns Science and Technology Charter School in Oak Hill and Kristi Engels of Pinellas Preparatory Academy in Largo. Winning Champions Awards as charter school pioneers were Erika Donalds of Treasure Coast Classical Academy in Stuart, Jeffrey S. Wood, Attorney-at-Law at Tripp Scott in Fort Lauderdale, Cynthia Aversa of Indian River Charter High School in Vero Beach, Devarn Flowers, retired and living in Pembroke Pines, and Amy McClellan of the Florida Consortium of Public Charter Schools. Finally, awards were given to two preferred vendor partners of Florida charter schools. The two Preferred Partner Award winners were Charter School Capital and Building Hope.